Getting this radiator and trans cooler in an S197 is the worst radiator swap I’ve ever had the misfortune of dealing with. The core is more than twice as thick as the stocker. Made for a REEEEAAAAL fun time snaking it in with the transmission cooler attached (you have to do it this way). 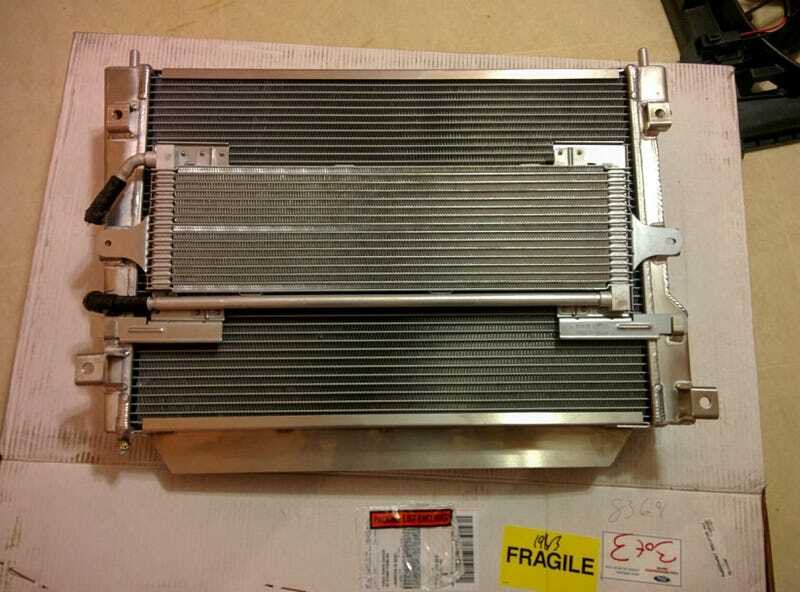 Trans cooler is larger as well, same thickness as stock though. Did I mention using the stock hardware is out of the question in some places? Did I mention grinding was involved on the mounting tabs to get the fan to fit properly? How about the fact this is a Ford Racing radiator designed for this vehicle? I’m still not done because grinding and 2 trips to Home Depot....I’ll finish tomorrow. Im in the home stretch, but need sleep. Very frustrating.... Had to vent. ‘85 Buick Riviera that was recently on eBay in the EXACT color scheme I want for your time.